From donations to sponsorship, we seek to uplift the Fairbanks community. We believe community contributions of all kinds are important, which is why we make donations to dozens of organizations and events: Fairbanks Ice Dogs, Alaska Nanooks, Yukon Quest, Alaska Goldpanners, Fairbanks Youth Soccer Association, the UAF School of Management and more. Spirit of Alaska also contributes to our schools and provides support for great non-profits such as the Fairbanks Resource Agency and Fairbanks Youth Advocates/The Door who are working hard to improve our community and make life here in Fairbanks better for everyone. 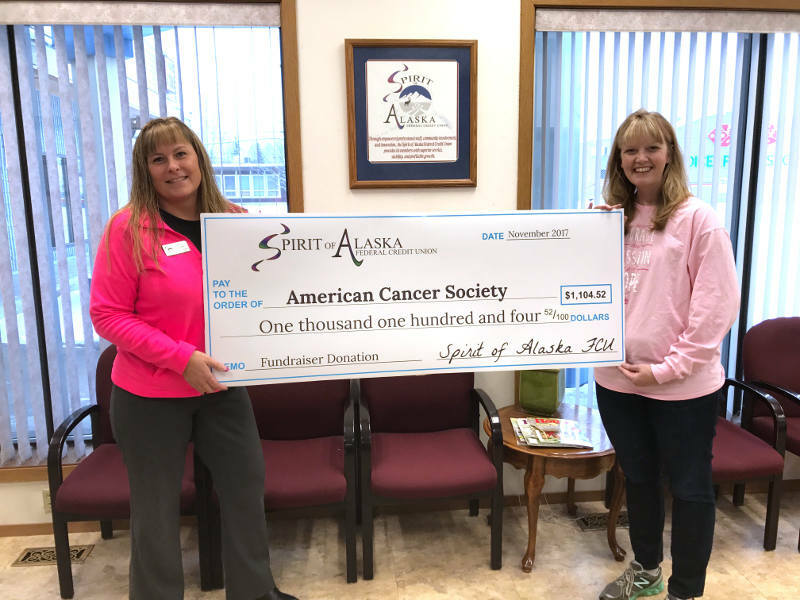 Spirit of Alaska holds a quarterly donation drive for different causes and community non-profits. In 2018, we are working to fill School Food Pantries. Find out how you can help. "Thank you so much for going above and beyond to help us with our banners. We appreciate it so much!!" Spirit of Alaska Federal Credit Union got its start as a caring credit union founded by teachers. We continue to support our schools and the university through our business partnerships in the past and moving forward. We also provide free financial education curriculum through Banzai! to select schools in the area, as well as regularly attending Get Real Financial Reality Fairs in concert with other business volunteers. 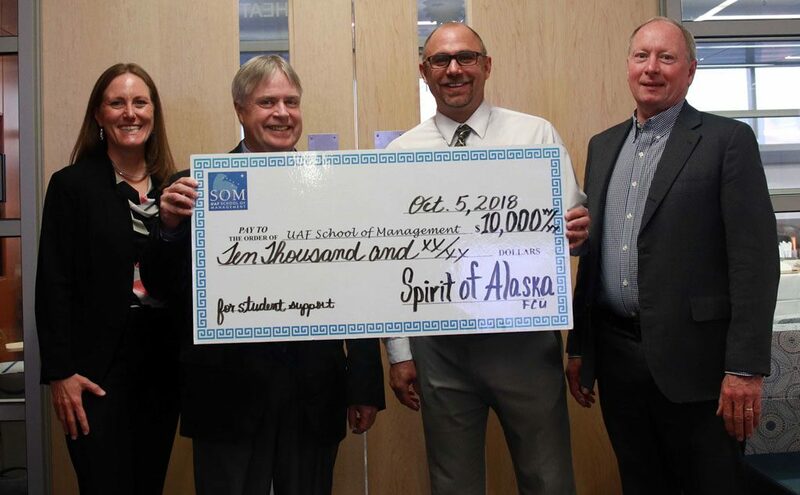 Anthony Rizk (center right) presenting check for $10,000 to UAF School of Management representatives Christi Bell, SOM Dean Mark Herrmann and Dr. Charlie Sparks on October 5th, 2018. We are proud to provide major support to these events in the community in the past or currently through in-kind and monetary donations, as well as volunteering from our employees. 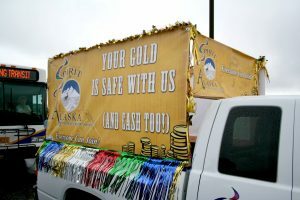 What kinds of programs/events does Spirit of Alaska FCU support? Spirit of Alaska supports a wide variety of organizations, services, and non-profits in the Greater Fairbanks area. Generally, our goal is to make financial or in-kind contributions that are supported by our members. We started as a teacher’s credit union in 1960 and so education-based organizations and events are important to us. Who can apply for a donation/sponsorship? Our budget is very limited, but we do consider every submitted written request. Educational and Service-oriented groups and events are given top-most consideration. Do you give monetary contributions or in-kind? We prefer to give in-kind contributions and can offer support marketing to your campaign or event. Monetary support is most commonly given to charitable groups, services, or educational events.